I like an anniversary, so I was out yesterday investigating one. I like blogging an anniversary, so I was out yesterday even though the actual date isn't until the weekend. And normally I keep quiet about an anniversary until the actual date, but in this case I thought I'd mention it in advance in case any of you lot want to go. I reckon at least three of you might be interested. Here are ten reasons to consider visiting Faversham, the tenth of which is the specific reason you might want to visit this week. 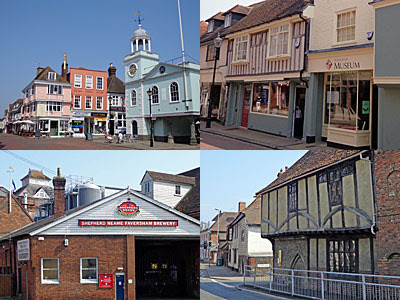 1) The town centre: Unusually for Kent, the Luftwaffe mostly gave Faversham a miss, so a substantial number of old buildings survive. Many are half-timbered, some overhang the streets, and West Street in particular is a twisty gem. Most of the shops are independent traders, of the useful rather than the snootily antique-ridden kind. For an added bonus I visited on market day, with a pitch-perfect selection of traders gathered around and under the Jacobean Guildhall. Far far more unspoilt than any retail centre has a right to be. 2) Shepherd Neame Brewery: Britain's oldest brewer is based down by the creek, and the smell of hops permeates this corner of town. It's possible to take a tour and see inside, including samples of the liquid goods, but this should probably be be booked before you arrive. Or just drop into a Shepherd Neame pub, of which there are several across the town, indeed I had to look twice when I finally spotted one that wasn't. The Faversham Hop Festival takes over the town on the first weekend in September, and is a joyous celebration of beer, music, beer, morris dancing, beer, street food and beer. 3) Fleur De Lis Heritage Centre: One of England's better town museums, this one threads through a 15th century pub and adjacent buildings. The interior is helped immensely by Faversham having a chequered history, from royalty to gunpowder, plus all the usual local ephemera. Nextdoor is an extremely well-stocked tourist information centre, focusing on places and heritage hereabouts, rather than simply a load of brochures about somewhere else. I wonder where the actual tourists come from, but this is spot on. 4) Maison Dieu: What's now the A2, just to the south of the town, used to be part of Watling Street. Pilgrimages to Canterbury made the small village of Ospringe unduly important as a stopover point, and the equivalent of a medieval service station opened up. Most of that's long gone, alas, but English Heritage will happily welcome you to the flint-and-timber wayside hospital at the top of Water Lane for a two-pound-fifty poke-around. Weekends and bank holidays only, from Easter to October. 5) Brogdale: Immediately to the south of the M2, Brogdale is the home of the National Fruit Collection, a government sponsored project to aid experimentation and preserve diversity. Its sprawling acres are home to 3500 named varieties of fruit, including apples, pears, plums, cherries and quinces - with two of every variety for ecological safety reasons. I thoroughly enjoyed my orchard tour the last time I was here, and the opportunity to ride the (rare) 9 inch gauge Faversham Miniature Railway. Britain's warmest ever temperature was recorded here, slightly controversially, in August 2003. 6) Chart Mills: Faversham first entered the gunpowder trade in the 16th century, the town's main stream ideal for watermill power. Chart Mills is a Napoleonic survivor, decommissioned in the 1930s but since lovingly restored and now the oldest working gunpowder mill in the world. The small building's not easy to find (in the middle of a housing estate, just round the back of the Shrine of St Jude), and it's not often open. But come on a weekend afternoon (like I did last time) and the ever-so friendly volunteers would love to show you round inside, and maybe watch the proper-old waterwheel go round. 7) Oare Gunpowder Park: As the gunpowder industry grew up, it moved incrementally out of town so as not to put the inhabitants in too much danger. Oare Gunpowder Works opened at the top of Oare Creek in the late 17th century and stayed in production until 1934, after which the gates were locked and nature took over. The local council transformed the linear site into a country park about a decade ago, preserving what was left of various key buildings and encouraging wildlife to thrive. There's much to explore, including several twisty paths past all sorts of peculiar once-important structures, and sufficient interpretation boards to guide you round even when the Visitor Centre is shut. 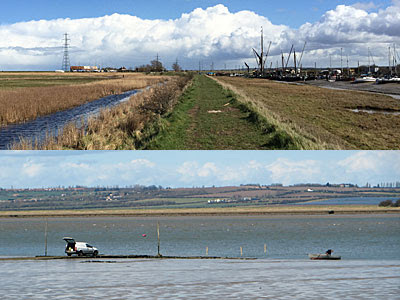 8) Creekside walks: Faversham sits a couple of miles back from where the Thames ought to be, if only the Isle of Sheppey hadn't got in the way. A couple of creeks fork down to the Swale - the channel between the island and the mainland - each hugged on both banks by a footpath on a raised seawall. The central circuit round the rim of the Ham Marshes is a popular local hike, peaking halfway with a pint at The Shipwrights Arms at Hollowshore. I took the western bank of Oare Creek instead, advancing past anchored barges into increasingly open farmland and marsh. Other than the ten minutes of unsheltered horizontal downpour, quite glorious. 9) Oare Marshes: Nudged up against the Swale, the Oare Marshes reserve is a large expanse of reedbed, marsh and brackish dykes, and an important wetland habitat. This Kent Wildlife Trust sanctuary is the place to see countless estuarine birds such as curlews and shovelers, so I was glad I'd brought my binoculars, even if I wasn't always sure quite what I was looking at. A single track through the centre leads to Harty Ferry, once the embarkation point for crossings to Sheppey. These ceased some time back, but I was still entranced to watch a van edging out down the narrow causeway at low tide so that its driver could row out into the channel to check his buoyed nets. 10) The Great Explosion (Sunday 2nd April 1916): And finally, the reason why I was out in the middle of nowhere. One hundred years ago this Saturday a hut full of wartime explosives blew sky high, leaving a crater 150 feet in diameter and 15 feet deep, and killing more than a hundred munitions workers. I'll tell you more about it on the anniversary itself, but special events are afoot in the area should you wish to take part. Faversham's main church is hosting a Great Explosion exhibition in the north transept, which is highly evidence-based. A memorial service is being held at the town's cemetery where a mass grave was established. Most interestingly, a strip of private farmland near the site of the explosion has been opened up, for one week only (Good Friday-Sunday 3rd), allowing visitors to see some of the foundations and waterways not normally accessible. The so-called 'Explosives Walk' starts in the small village of Uplees, near the site of the DLR station, where afternoon teas will be served this Saturday and Sunday afternoon. Like I said, it's the sort of thing that only about three of you are likely to be interested in, but I found it deeply interesting, and rather special, and wonderfully emptily remote.